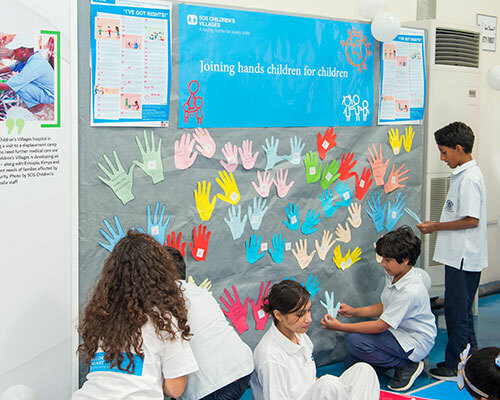 Dubai, 20 November 2018 – On the occasion of the World Children’s Day, the International Humanitarian City (IHC) hosted a group of 40 children who were taken on a unique tour of its warehouses and showroom. The 10-year-old students learned about the role of IHC in facilitating emergency responses and strengthening cooperation among humanitarian agencies who provide help to other children in need during crises all over the world from Bangladesh to Haiti. Divided into groups, they explored the work of various international aid agencies and raised their voices in support of children’s rights and wellness. In a session jointly managed by IHC members, UNICEF and SOS Children’s Village, these potential leaders of tomorrow learned more about their rights as well as the challenges disadvantaged children face across the globe from poverty, violence, and natural disasters. They also had the opportunity to express their ideas and commitment to assist the most vulnerable. World Children’s Day is marked each year on November 20th and marks the anniversary of the adoption of the Convention on the Rights of the Child. Under the umbrella of Mohammed Bin Rashid Al Maktoum Global Initiatives, and chaired by HRH Princess Haya Bint Al Hussein, IHC is a global humanitarian hub offering tremendous support to all its members and boosting their capacities to address humanitarian needs rapidly and efficiently.